Master Liang, Shou-Yu and Dr. Yang, Jwing-Ming work together to reveal the essence of Xingyiquan (Hsing Yi Chuan). The book presents traditional Xingyiquan training, including two sequences with many of their martial applications, and the famous fighting set "An Shen Pao". The most unique part of this book is the discussion of Xingyiquan theories and principles, drawn from many of the ancient poems and songs. The companion DVD brings the training to life revealing the precision of proper Xingyiquan training. Combined, you will have the tools necessary to build a solid foundation in the style of Xingiquan. Bundle contains 1 book and 1 DVD. Xingyiquan, or 'Shape-Mind Fist' is a well-known Chinese internal Kung Fu which imitates the movements and characteristics of twelve animals, with martial applications by Grandmaster Liang, Shou-Yu. Mastery of these animal forms gives you a variety of simple and effective fighting techniques. Xingyi training also builds your Qi (energy) for improved health, and your muscular strength for incredible power and vitality. The fundamental postures are demonstrated, including the Five Phases, with explanations of their relationships to Five Elements Theory. Senior students demonstrate the two-person Five Phases Matching exercise and Linking sequence, which improve your reaction speed and attack/counterattack skills. Lastly, the Xingyiquan sequence and each of the twelve animal forms with martial applications are shown. Xingyi means "Shape Mind", and Quan means "Fist" or "Style". The name derives from the style's imitation of the movements and inner characteristics of twelve animals. The style was created by Marshal Yeuh Fei, a famous general of the Chinese Song Dynasty. The practice of Xingyiquan, like Taijiquan, improves Qi circulation in the body and maintains health. In addition, the training builds up an abundant level of internal Qi so that both the physical body and the mental body can be strengthened. This book presents traditional Xingyiquan training, including two sequences with many of their martial applications, and the famous fighting set "An Shen Pao". The most unique part of this book is the discussion of Xingyiquan theories and principles, drawn from many of the ancient poems and songs. Understanding these will greatly speed your training. Deepen your Understanding for Great Xingyi. 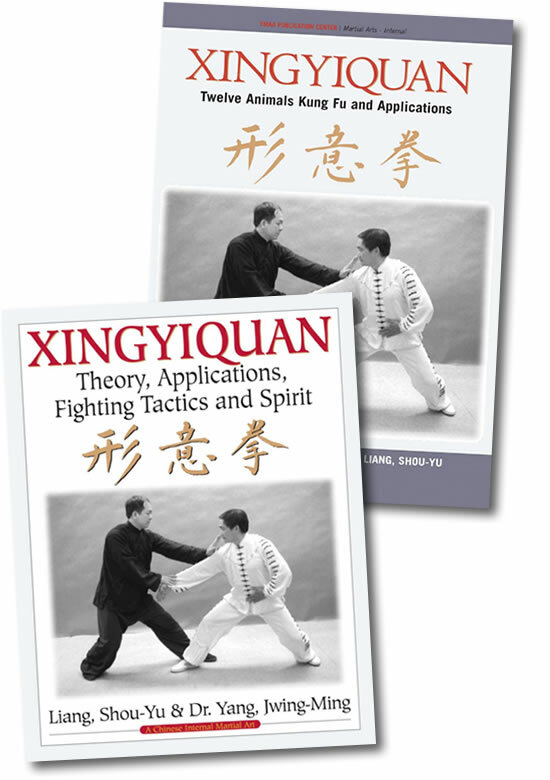 Xingyiquan—Theory, Applications, Fighting Tactics, and Spirit 2nd ed.